SKU: 81. 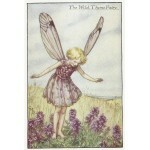 Categories: Antique Prints, Fairies of the Summer, Flower Fairies. Tags: charles dickens, cicely mary barker, countryside, flora, flower fairies, flower fairy, flowers, garden, gardening, gifts, herb, herbs, lilac, original print, petals, picture framers, picture-framing, presents, prints for sale, summer, thyme, vintage print, vintage-picture, wild flowers, www.frontispiece.co.uk. Flowers. 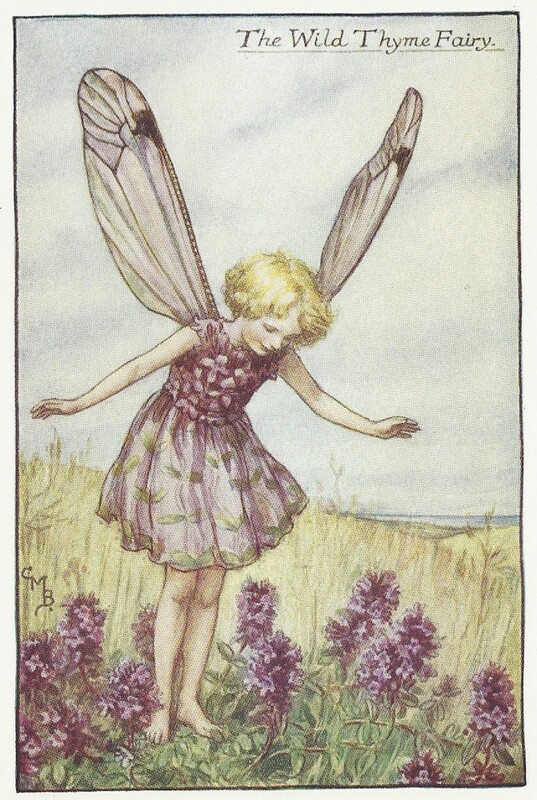 The Wild Thyme Fairy. Wild Thyme, Thymus serpyllum, known by the common names of Breckland thyme, wild thyme or creeping thyme, is a species of flowering plant in the mint family Lamiaceae, native to most of Europe and North Africa. All Flower Fairies are provided mounted, in conservation quality antique white mount-board, size 10×8 inches, ready to frame. Note: Price displayed is ex VAT. Flowers. 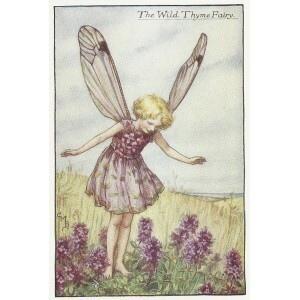 The Wild Thyme Fairy. Wild Thyme, Thymus serpyllum, known by the common names of Breckland thyme, wild thyme or creeping thyme, is a species of flowering plant in the mint family Lamiaceae, a herb native to most of Europe and North Africa. Original vintage flower fairy print from Cicely Mary Barker’s ‘Flower Fairies of the Summer,’ published by Blackie & Son. Cicely Mary Barker (1895-1973) was born in Croydon, Surrey, England on 28th. June, 1895. The youngest child of Walter and Mary Barker, Cicely was an epileptic child and was cared for and educated at home by her family. Here she was influenced by the work of Victorian illustrators Kate Greenaway and Randolph Caldecott. As well as home tuition, Barker benefitted from correspondence courses. At age 13 she attended evening classes at Croydon School of Art, where she continued to study until the 1940’s. As a 16 year old she sold her first four pieces of art to the postcard producers Raphael Tuck and Sons. However, her breakthrough occurred with the publication of ‘Flower Fairies of the Spring’ in 1923. This was followed in 1925 with ‘Flower Fairies of the Summer,’ which produced the first royalties for the artist. Botanically correct, if Barker was unable to obtain local examples of flowers she wished to paint, she would use the specimens at Kew Gardens for her research. As for the characters of her flower fairies, many were based on children she knew and children who attended her sister’s nursery. Although primarily known for her Flower Fairies, Cicely Mary Barker was a contributor to many journals and books, especially in the field of Christian literature. She contributed to the SPCK with her postcards and birthday cards. Similarly, with Christmas cards produced for over 20 years for the Girls’ Friendly Society. She also published several Christian themed books and contributed to the interiors of churches with which she was associated. Thanks to Wikipedia for links provided on this page.